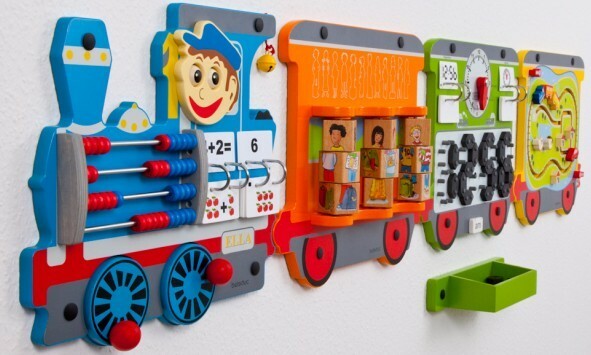 Toys for Time Wall Toy Train Tom is a particularly attractive form of wall ornamentation with educational characters. It has 4 different series including Loco, Kids, Time and Trip, each made with different themes and brought different fun & educational meanings for children. There are four individual units Loco, KIds, Time and Journey so you can make the Train as long as your wall can be! PROMOTES FINE MOTOR SKILLS AND HAND-EYE-COORDINATION. There is a different visual display with the turn of each knob. Kids will learn to identify all the colors and graphic designs.